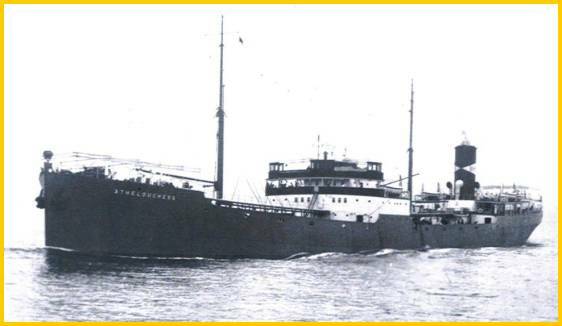 1943 21st August During a force eight south-westerly, in ballast, she was sailing, at night, in convoy out of Milford Haven, round St. Ann`s Head, past Skokholm Island, bound for New York, but whilst forming convoy she was taken by the wind ashore near the Smalls Lighthouse ( Pembrokeshire ). None of the 62 crew were lost. Stranded on the Smalls, she broke in two. The bow section drifted off and slipped under the water. The stern section was towed by tugs into Dale Roads (Cardiff), and sold off, by the Underwriters, to Yngvar Hvistendhal, who had a new bow section built at Devonport Naval Dockyard, completed December 1947. 1943-1947 in Dale Roads, the stern was manned by an Officer, an Officer`s steward, and Chief Engineer, John Rosine, of Dundee. Her engines were turned regularly. 1948 Norway MILFORD. Partrederiet Milford (Yngvar Hvistendhal),Tonsberg. 1954 Belgium JEAN MARIE. Soc. Commerciale A. Vloeberghs, S.A, Antwerp. 1956 renamed MANO. Cia. Naviera Mara Ltda, Monrovia, Liberia. 1957 converted to bulk carrier / dry cargo ship. 1959 re-engined by J G Kincaid. Service speed 10 knots. 1962 renamed RONGA. A/S Asplund (Ronneberg & Galtung), Moss, Norway. Kong), Monrovia. Tonnage now 9206. Bulk carrier. Length: now 492 ft.
1966 Cia. Naviera Pearl (same managers). Under the Liberian flag by Formosan owners. 1971 17th August Stranded at Lantao Island, Hong Kong during a typhoon. Hurricane Signal Nr 10 was hoisted at 10:50 p.m. on 16 August 1971.
and hundreds of smaller vessels. 4 hours at Tate's Cairn. A total of 5,644 people were made homeless. The BILLY was refloated but heavily damaged. 1971 8th November Arrived Kaohsiung, Taiwan for scrapping. Built 1968 Uddevalavarvet A/B, Uddevala, Sweden. 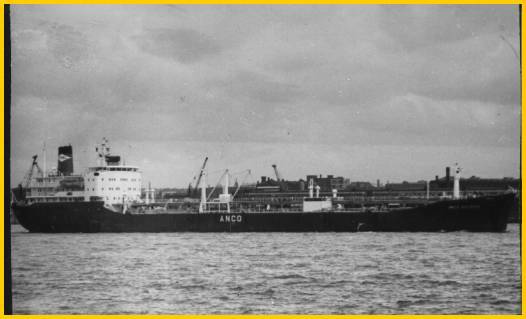 Athelduchess Tankers Co., Ltd, Liverpool. 1979 sold to Locafrance Service S.A., France renamed TARN. 1984 sold to Ravenanavi S.p.A., Italy renamed TAURUS ERRE. 1988 sold to Fyvie Shipping Co, Panama renamed EVA COB. 1991 renamed EVA same owners. 1994 Arrived at Alang, India, 5th September for demolition and scrapped.